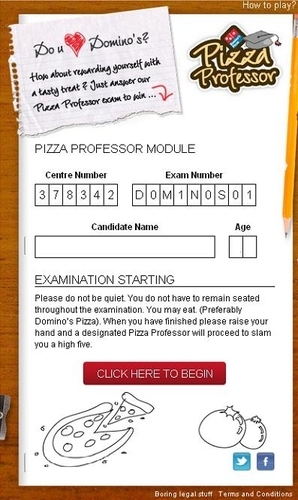 To celebrate A-level results last week, Domino’s, the pizza delivery expert, has launched a Pizza Professor Exam on Facebook. The app will give students the chance to win voucher codes depending on their knowledge of Domino’s. If you’ve always fancied yourself as an expert when it comes to pizza, this is the exam for you! Simply answer a series of pizza-related multiple choice and open-ended questions on Maths, Science, English, Art, Philosophy and Geography using the new app at www.facebook.com/DominosPizza. Test your knowledge by working out equations on sharing pizza slices, identify famous scientific discoveries which could have been made with pizza and philosophise about the merits of a round pizza in a square box. Get your paper marked online by Domino’s straight away and receive a voucher code depending on what grade you achieve. There are pizza goodies up for grabs for every grade. If you’re a model student and one of the first ten people to score an A, you’ll go straight to the top of the class and receive a very tasty, free Domino’s pizza. For more details and to sit Domino’s Pizza Professor Exam, find Domino’s on Facebook at www.facebook.com/DominosPizza. Domino’s Pizza Professor Exam is running on Facebook until Thursday August 25, 2011. Available to UK Facebook fans only. Domino’s Pizza UK & IRL plc is the leading player in the fast-growing pizza delivery market and holds the exclusive master franchise to own, operate and franchise Domino’s Pizza stores in the UK and the Republic of Ireland. The first UK store opened in Luton in 1985 and the first Irish store opened in 1991. In April 2011, the Group acquired a majority stake in the exclusive master franchise to own, operate and franchise Domino’s Pizza stores in Germany. As at 26 June 2011, there were 688 stores in the UK, Republic of Ireland and Germany. Of these, 543 stores are in England, 47 are in Scotland, 28 are in Wales, 18 are in Northern Ireland, one is on the Isle of Man, one is a mobile unit, 48 are in the Republic of Ireland and two are in Germany. Founded in 1960, Domino’s Pizza is one of the world’s leading pizza delivery brands. Through its primarily franchised system, Domino’s Pizza operates a global network of more than 9,350 Domino’s Pizza stores in 70 international markets. Domino’s Pizza has a singular focus – the home delivery of pizza, freshly made to order with high quality ingredients. Customers in the UK can order online at www.dominos.co.uk and customers in the Republic of Ireland can order online at www.dominos.ie. In addition, mobile customers can order by downloading Domino’s free iPhone and Android apps. This press release was distributed by ResponseSource Press Release Wire on behalf of Arena Quantum in the following categories: Food & Drink, for more information visit https://pressreleasewire.responsesource.com/about.